Welcome to the web site of NEA Sidesaddle Association, the oldest sidesaddle group in the country. 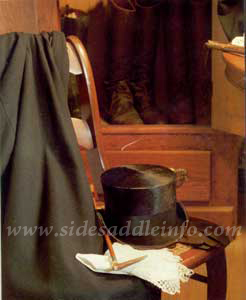 Our goal is to provide education, promoting the contemporary use of the sidesaddle and preserving its rich traditions. NEA has been influential in setting standards of safety and equipment for today's equestrienne and has worked closely with other non-profil organizations to establish criteria for showing, teaching and promoting this elegant form of riding. ©2000-2012 NEA . Sidesaddle Assoc. All rights reserved. No reproduction permitted.